When I spoke to my mother in law she told me that the last time she had attended Mickey’s Verry Merry Christmas Party was when it first started. Back when my husband was a little boy himself! I just couldn’t believe it! So, I spoke to my husband and told him that we should purchase a ticket for her to join us. I’m so excited we did because no one does Christmas like Walt Disney World! I’m not just saying that either! I mean come on! Where else can you take an adult and watch them become a kid again? I’ve experienced this twice now. Two years ago with my husband’s grandmother and this year with her daughter. 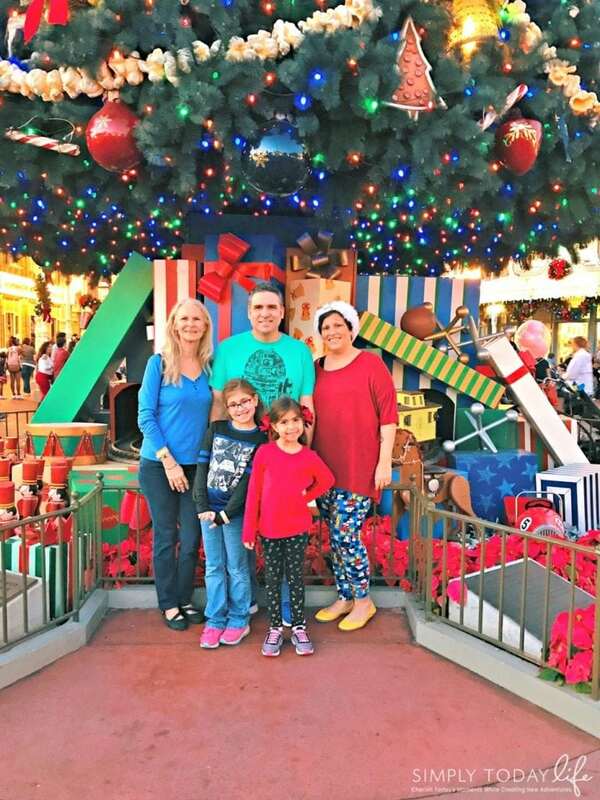 I will never forget the look on their faces as they experienced all of the Disney wonders during the holidays with their grandchildren! 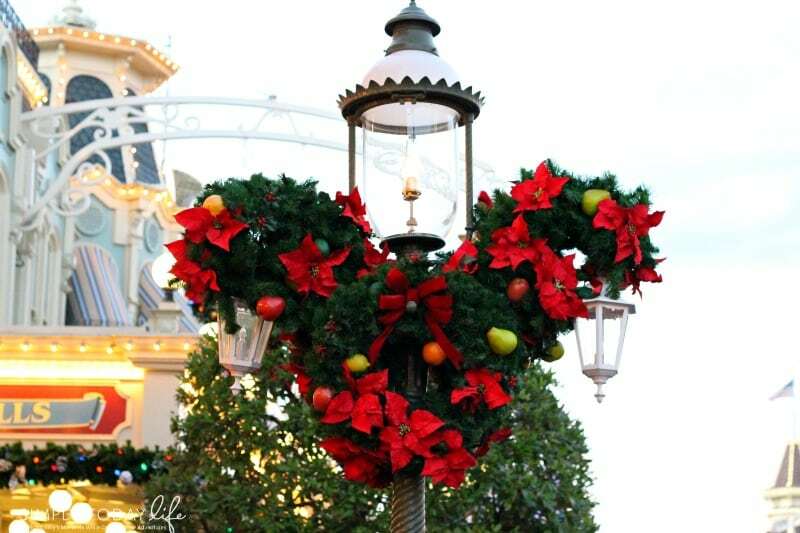 The party begins on November 9th and goes to December 22nd on select nights at the Magic Kingdom. Tickets sell out fast, so make sure to choose your preferred date as soon as possible and purchase. Although, the party doesn’t begin until 7:00 pm guests are allowed to enter the park as early as 4:00 pm. Just remember, if you are planning a day at the park grab your wristbands in designated locations marked on the Christmas Party map. No need to even leave the park! On the other hand, if you are visiting for the day and not stay for the party, be ready to be asked to leave after 7:00 pm. This is a special event and you do need an extra ticket to attend. 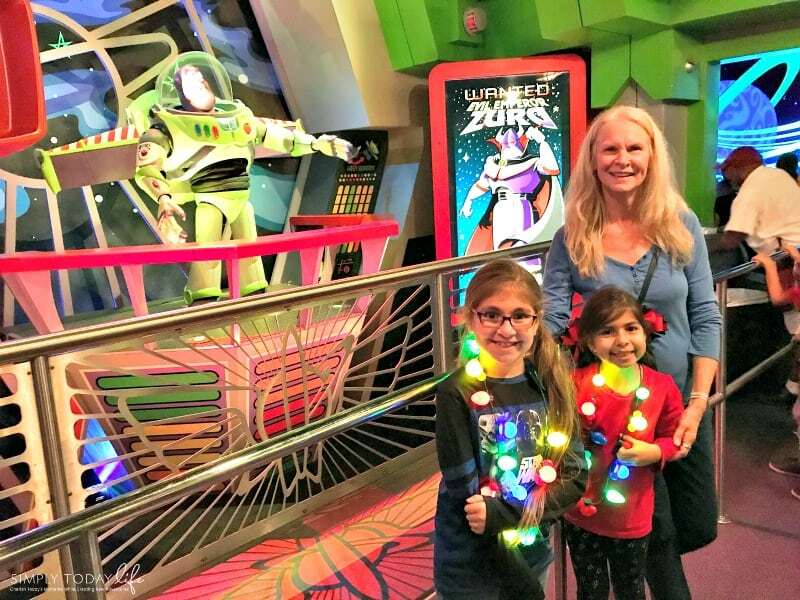 I could tell my mother-in-law was just as excited about the rides as my girls were! For some reason, they prefer to do that over anything else! I will be the first one to admit, it gets a bit crowded during any of the special events at Walt Disney World, but nothing like Mickey’s Verry Merry Christmas Party! Many of the guests at the party have been there all day and are now looking forward to all of the treats, special characters, and performances. That’s why it’s also my favorite time to hit those rides! Yup! No matter how busy the party is, the lines are always shorter during these events. The longest line wait we saw was of course for the Mine Train, but it was under an hour long. Score!! 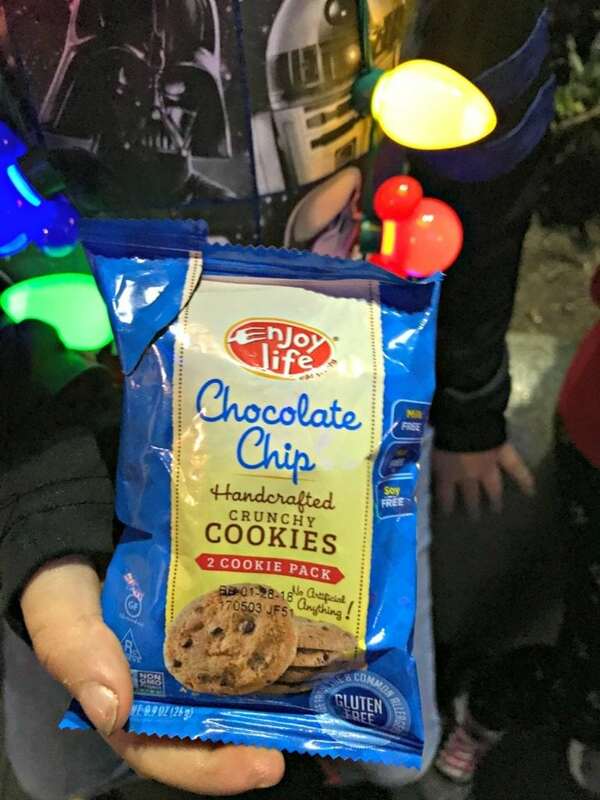 I’m not kidding when I say you can have all of the never-ending treats you want, but Disney always wins me over with their allergy safe treats! 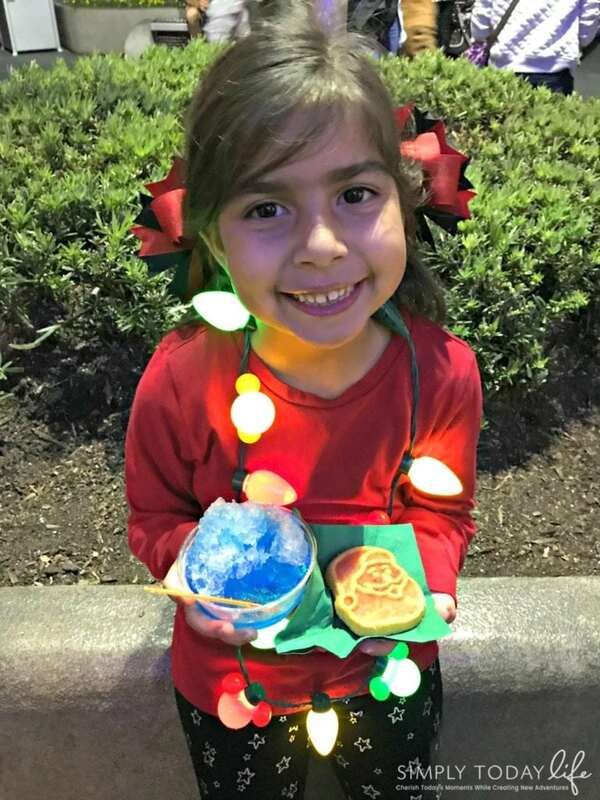 As I shared in my Mickey’s Not So Scary Halloween Party post of this year, holidays can be very difficult for my daughter who suffers from several food allergies. That’s why we always choose Disney when it comes to celebrating these special moments! She knows that she too will be included and will be able to enjoy all the treats she wants! Even my mother-in-law loved the safe treats! 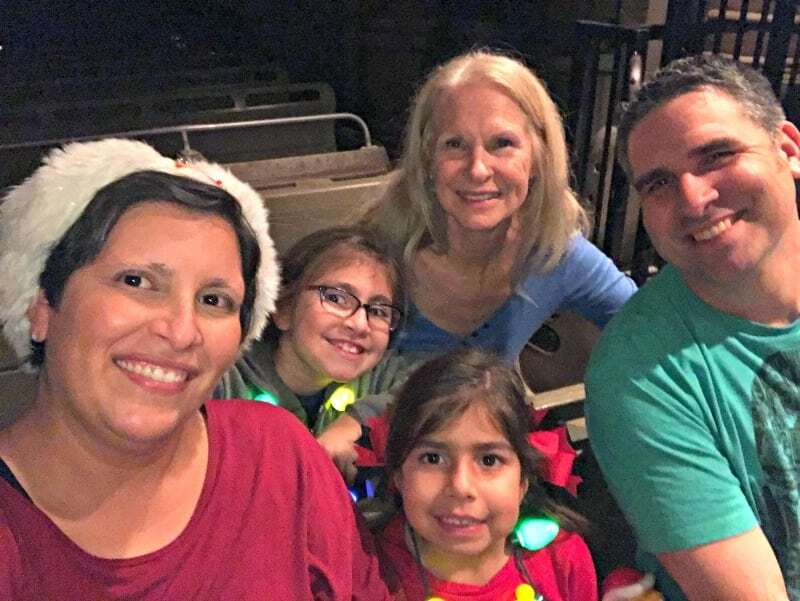 Although, we weren’t set on watching anything specific I wanted to at least give my mother-in-law the chance to enjoy those moments with her granddaughters and son. So made sure to find a comfy spot so that we could watch the shows. We found the perfect spot with enough room for dance and sing-along! 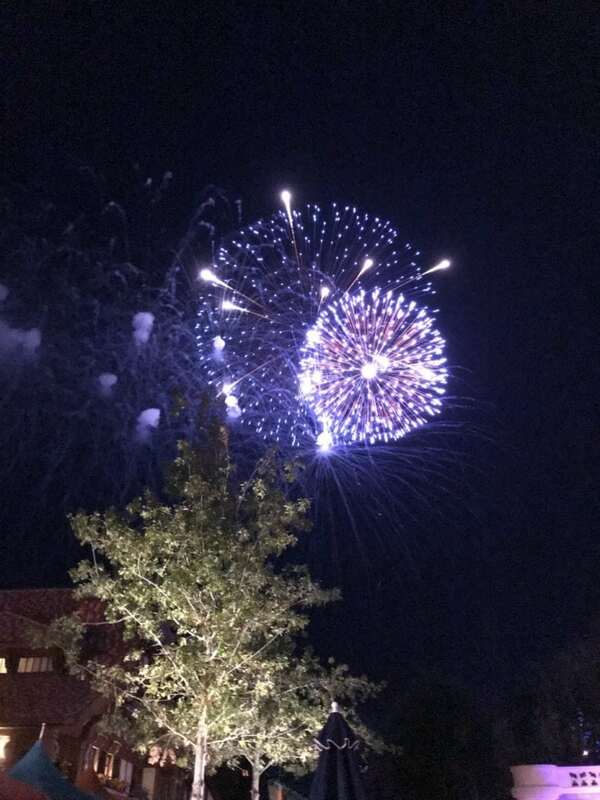 If you don’t want to miss any of the shows, parades, and fireworks make sure to plan your route so that you have time to do everything you would like. This is super easy to do as soon as you get in by checking out the times of the events. Most staged shows in front of Cinderella’s Castle are right after each other. 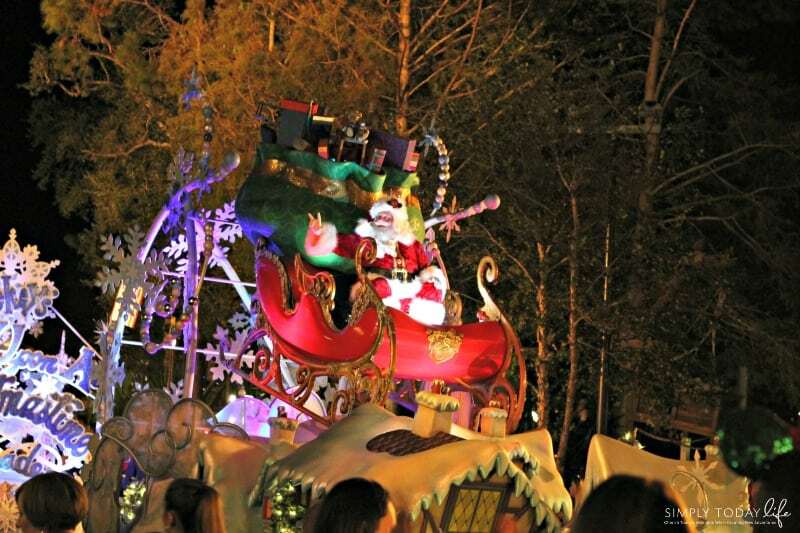 Making it easy for your family to find a spot and stay there for the duration of the shows, including the parade. This year we found a spot near the Tomorrowland entrance where we could sit, enjoy snacks nearby, and watch the shows without being crowded. It was perfect! You can find the same spot on the opposite side of Cinderella’s Castle by the Frontierland entrance. If you wish to have a closer look make sure to find a spot early because it will fill up really quick! The parade goes by twice during the party, so don’t fret if you missed the earlier one. Now, I believe that the best location to watch the parade is on Main Street! This is where you will see lots of magic happen, like snow! With that said, my favorite location to watch the parades is in Frontierland. For some reason, it’s less crowded and you can find a higher spot in front of the shops with benches to sit on. 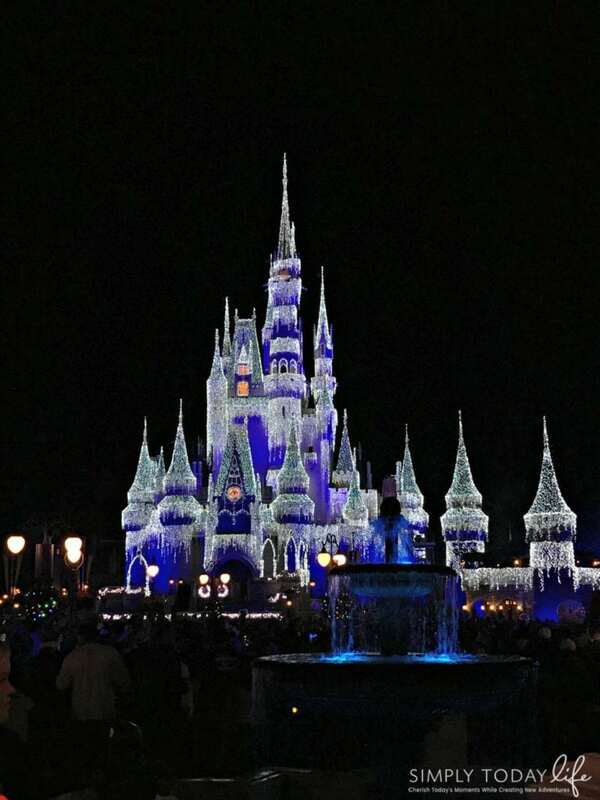 The best view for Holiday Wishes is in front of Cinderella’s Castle, but you can watch them from anywhere in the park. This is usually how we end the night. Walking back to the entrance watching the fireworks and picking up some more treats along the way. 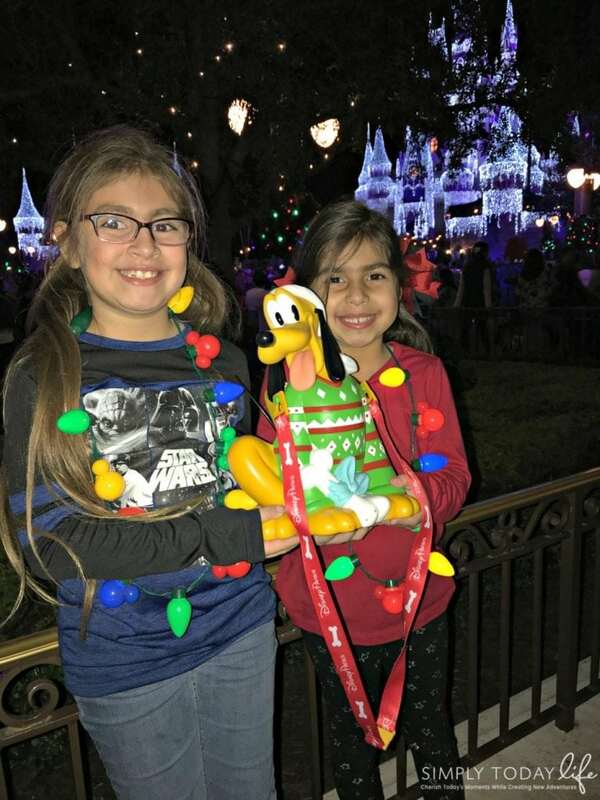 There are many photo opportunities throughout the park with all of the holiday decorations and characters. This year we decided to not plan much of our route, instead, we were going to be more relaxed than usual on our schedule. We would stop when we saw one of our favorite characters, a ride we wanted to do, or a show that was just starting. Believe me, I’m always stressing if I’m doing enough or are we seeing enough. To tell you the truth, we saw all the shows, parade, and rode tons of rides! I say that relaxing and enjoying the moment really paid off! Oh, just don’t forget to take tons of photos!!! There is so much more to do at Mickey’s Verry Merry Christmas that I didn’t even mention here, but the most important thing is to make sure to have fun! Enjoy every second with your family and create those important memories together! Make sure to visit Mickey’s Verry Merry Christmas Party website for more details, pricing, dates, and to purchase your tickets! 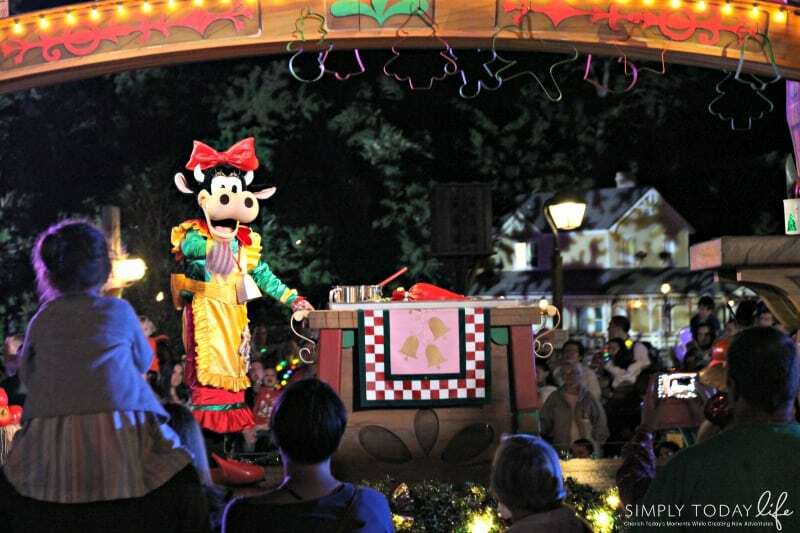 Are you visiting Walt Disney World’s Mickey’s Very Merry Christmas Party this year?